Just a capture from last night showing the storm that was hanging over the Hot Springs. I'm glad I had the cabin as there were rivers of water flowing through the parking lot. Morning brought more grey clouds and I packed up in a light drizzle. Once reaching Revelstoke, I knew that I needed to turn south but beyond that, I had only a general idea which way to go. One thing that I did know was to head for the free ferry across Upper Arrow Lake. I was fortunate that I didn't have to wait very long and it was a relaxing free boat ride. Once on the other side, I continued to head south. I noticed that the right exhaust header was leaking again and after inspecting the weld, I could tell that it wasn't covering enough area. The wall thickness of the metal just isn't very good. So I stopped at another shop and he went over it several more times bridging the brazing that the previous shop had done. 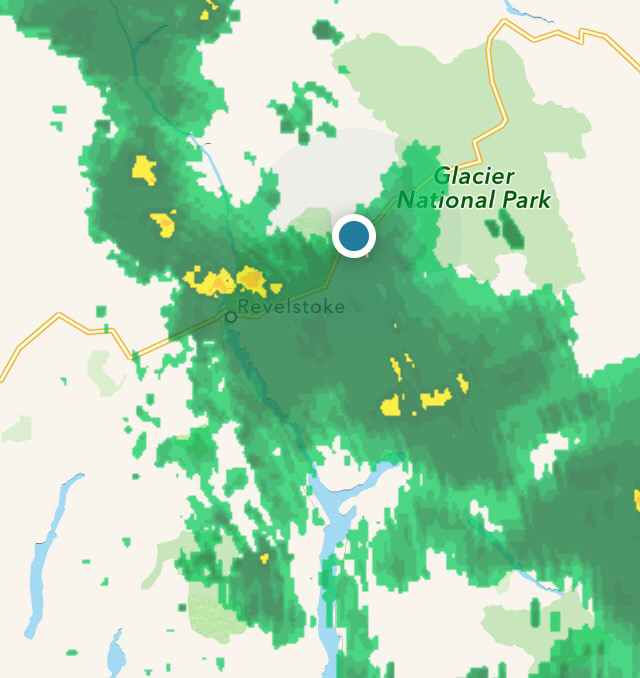 From the town of New Denver, I turned onto Hwy 31A heading over the mountains towards Kaslo. This was a really nice motorcycle road with hardly a straight section anywhere along its path. And there were a lot of motorcycles on the road all seeming to be in a big hurry when compared to a Ural. 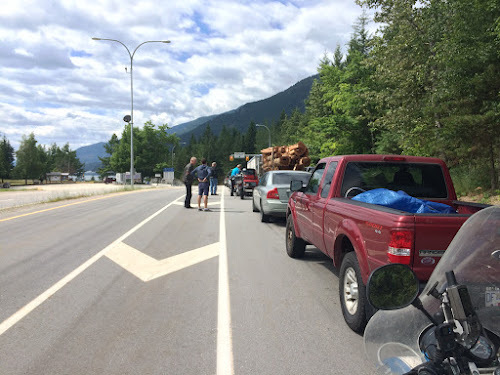 I filled up in Kaslo and headed south along the lake towards another ferry. From the description given me by the rider from Calgary, I should find the Toad Rock Motorcycle Campground about 5 km north of the ferry. That is where I'm staying at least tonight and tomorrow night. With Canada Day, most campgrounds were expecting to be overrun. Maybe I'll stay a bit longer if that's the case. 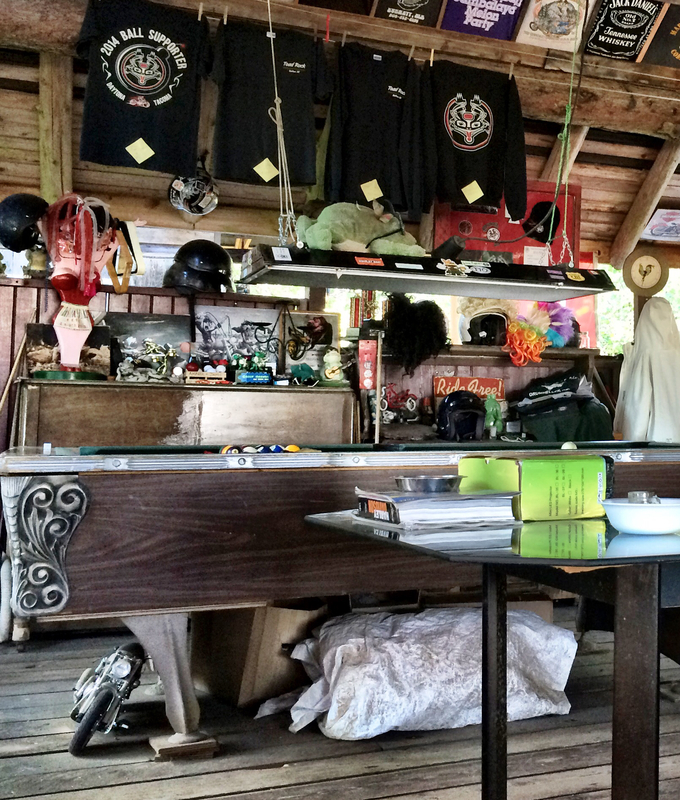 This is a snapshot of their pavilion with books, magazines, a pool table, kitchen, etc. Supposedly, a place to hang out. Normally, there's wi-fi as well but it's been down since the thunderstorms a few days ago. 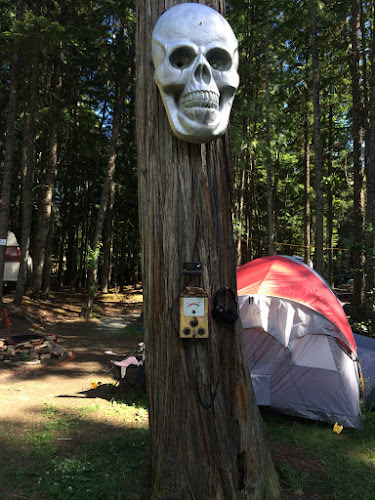 On a cedar trunk, there is an electronic device with head phones where you can spend your free time listening to aliens. They also have a small shop area where I'll change out my front tire, check the valves and possibly try and get my muffler to fit onto the header pipe a little better. It depends on what kind of tools I can find. What I need is a round slightly tapered piece of steel that I can fit the muffler opening over to pound on. If there is an alien radio maybe I can find something that'll work. Staying here at least another day. 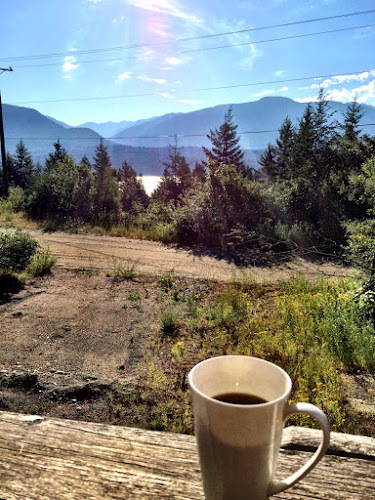 This morning, there was good coffee ($2 w/refills) and a great view of Kootenay Lake from their pavilion. I swapped out the front Heidenau K37 for the Duro street tire that I had brought along with me. Then went ahead and adjusted the valves. Both sides were a little loose but not excessively so and I probably need to add a little bit of oil. I removed the right muffler and using a piece of round galvanized plumbing pipe that was lying around, I worked the inlet to the muffler to be much rounder than before and now slips on far enough for the rear hanger to actually clamp onto the muffler. There is still an exhaust leak but hopefully it'll hang together long enough so I can get a replacement header and muffler. Today, July 1, is Canada Day but I'm told that last weekend was their long weekend since the 1st lands in the middle of the week. Still they are expecting a full house here. It's already 3:30pm and things are still really quiet. Next weekend is July 4th long weekend in the US so I'm still undecided which way to head. I'm tempted to simply head for the Corvallis area so I can take the rig to Raceway Ural in Salem, OR, but they wouldn't even be open until next Monday (at the earliest). This is my first non-riding day since Dawson City and it feels good to take a break. Hwy 31A, the twisty road from yesterday, is fun and challenging to ride on a sidecar but much more of a upper body workout than on a solo bike. Another reason for the short riding break. Glad you're dry and able to take a wee rest. It's nice to take a break; if you find a spot with good coffee, a view (and for you tools) then all the better. Haven't made up my mind if being able to talk to aliens is plus or minus though. Richard, please forgive me for a possibly "Oh, you've got to be kidding me!" question, but I'm intrigued: What is it about piloting a sidecar rig that makes it more of an upper body workout than riding a traditional motorcycle? To steer a bike you just use light pressure on the bars when counter steering. No such thing with a sidecar. You steer it with the bars and it takes quite a bit of effort especially when compared to a bike. The Ural is much easier than my Beemer as it has a leading link front suspension and much less trail. Trail is the distance from a line projected by the steering tube to the ground and the center of the contact point of the front tire. On a bike large amounts of trail add stability and causes the front wheel to turn when the bike leans. No leaning with a sidecar so you actually steer it around corners. And the faster or sharper the turn, the more effort required. Plus, you have to shift your body into turns i.e. move off the seat towards the sidecar on right turns. So on a twisty road you get a good workout. You must be exhausted with all this extreme heat we've been getting, I went for a 2 hour ride yesterday & wore mesh gear and I was knackered at the end and felt a little icky. Hope your muffler issue gets sorted out!!! It's kind of tiring but with the Ural needing fuel every 180 km or so, I stop often enough to rehydrate. No mesh gear for me this trip. All I have is the one piece Roadcrafter Light. So far, as long as I'm moving, no problem. What would it feel like if you had nothing at all to fix or challenge you mechanically? It's wonderful to have that peace of mind that you know what's going on with your machine and what to do about it. Essential, I'd say, especially where you are. I don't know. I think I enjoy "dinking" with things enough that it really doesn't bother me much. I am curious to hear how Raceway treats you in terms of getting the header fixed/replaced.